Click the Appearance command on the Options menu. Right-click the VueMinder task tray icon and select the Appearance command from the Options submenu. The Appearance tab on the Options Window enables you to specify appearance options. VueMinder uses Infragistics AppStylist theme files to control its appearance. A number of theme files are packaged with VueMinder. You can preview the theme files to find the one you like the most. Or, if you like creating your own themes, you can click the Customize button to create your own theme file. You can specify the folder that you want to search for themes. This defaults to the Program Files folder where the VueMinder executable is located and where the pre-packaged theme files are installed. If you download or create additional theme files, you can browse to the download location by using the "..." button. If the specified theme folder location contains theme files, these will be listed. If there aren't any theme files in the specified folder, the list will be empty. To select a theme, click on it. Then, click the Preview button to see how VueMinder will look using the selected theme file. Click the Preview button to preview the selected theme file. An example preview is shown below, using the "DarkGray.isl" theme file. Click the Use Default button to return VueMinder to using the default appearance file (VueMinder.isl). Themes can be created and customized by clicking the Customize button. The currently selected theme will be used as a starting point in the Appearance Theme Editor. By default, weekend date numbers have the same color as other date numbers in the Navigation Pane, Calendar View, and when printing. If you'd like more control over the date colors, like assigning each day of the week a different color, click the "Use advanced date color settings", and then click the "Advanced" button. The following window will be displayed. 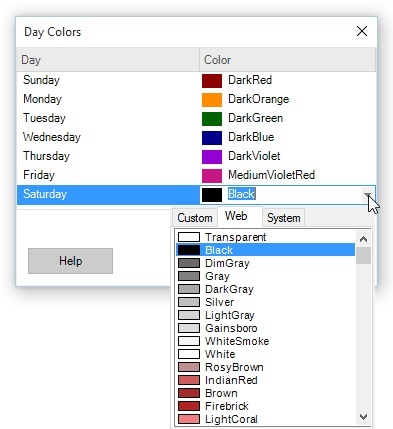 Using the example colors selected in the "Day Colors" window above, the Navigation Pane appears as shown below. The "Use event colors for Navigation Pane dates" checkbox enables control over whether the Navigation Pane colors dates based on the appearance of the events they contain. When checked, the Navigation Pane will appear as shown below, where some date colors override the day-of-week color setting. For dates that contain multiple events, the date color will be based on the earliest event. 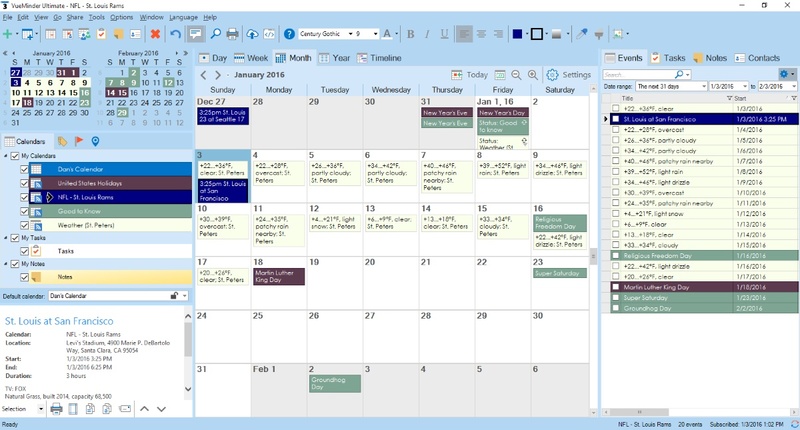 In the case where there's a tie, such as dates that contain multiple all-day events, the order of calendars in the Calendar List will be used to break ties. Calendars that are higher in the list will take priority when coloring dates. When unchecked, the Navigation Pane will appear as shown below, where date colors always use the appearance option and dates containing events are bold. The "Use event colors for Date Colors in the Day, Week, and Month Views" checkbox enables control over how date headers are colored. When this option is checked, date headers will use the appearance of the first event occurring on the date, as shown in the example below. If you don't like the default highlight color used for the selected date, you can select a different color after checking the "Use date selection highlight color" box. In the example below, the selected date is colored orange instead of the default light-blue. As with the selected date color, you can optionally choose a color for the current date. This option can be used to help the current state be more apparent when looking at the calendar. To select a color, first check the "Use current date color" box. By default, events all share the same appearance, which is controlled by the calendar that owns the event. The calendar and event appearances are updated whenever changes are made to the Appearance toolbar, regardless of whether an event is selected in the Calendar View or Event List, or a calendar is selected in the Calendar List. This behavior can be overridden using the option shown above, enabling each event to have its appearance individually modified. When this option is used, the Appearance toolbar behaves differently depending on the current selection. 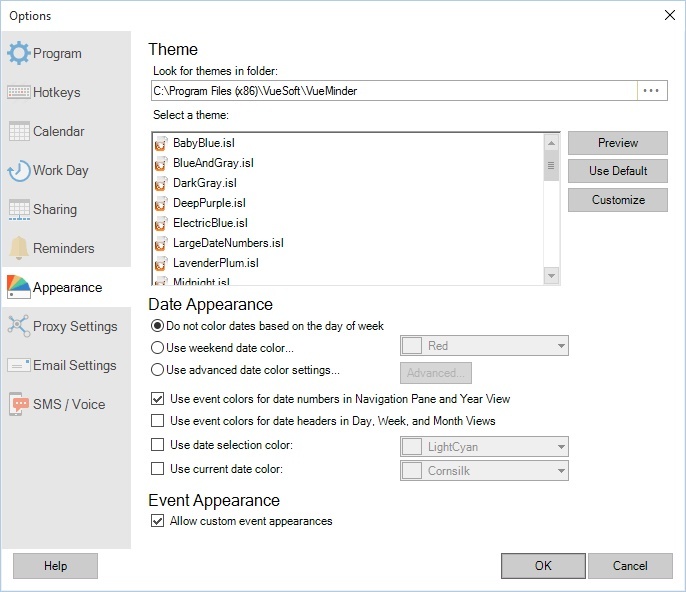 If an event is selected in the Calendar View or Event List, only the selected event will have its appearance modified. 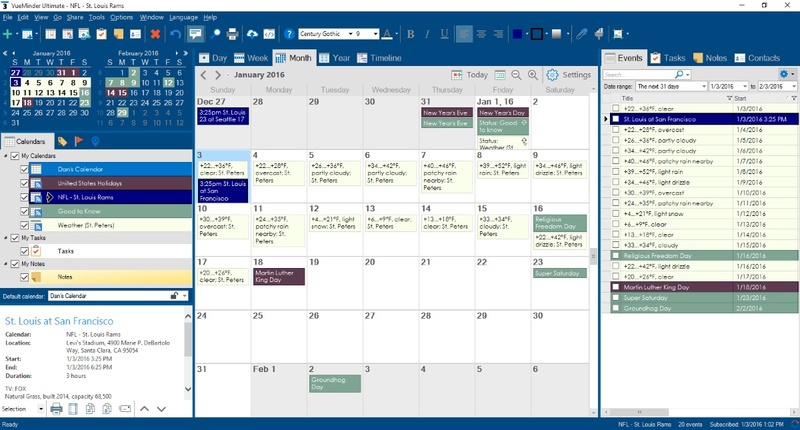 If a calendar is selected in the Calendar List, all events belonging to that calendar will have their appearances updated, with the exception of any events that previously had their appearance individually modified. This flexibility enables you to visually modify an individual event, in case you want to draw attention to it, without requiring the event to be in a different calendar.